Centre for Young Leaders in Africa (CYLA) Communications Director Gerald Chiluba says his organisation has taken advantage of the peace accord signed by the ruling Patriotic Front (PF) and the opposition United Party for National Development (UPND) to come up with a road map on how to completely eradicate political violence in the country. 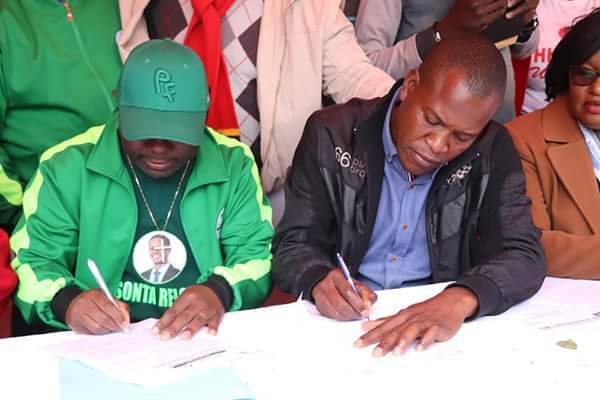 And Lusaka Province UPND Youth Spokesperson Otis Bwalya has pledged his party’s commitment to the peace accord which he described as a step in the right direction. Meanwhile Edward Siwale of the PF observed that youths were being used as tools of violence by political parties because they did not know their role. Speaking when the trio featured on Hot FM’s Talk on Monday radio program Chiluba known for being leader of the reneged Youth wing of the former ruling party-MMD Diehards said his organisation is sceptical that the accord will produce the desired results as it is seemingly a repeat of the same things done in the past hence their interest to design a road map to ensure that the scourge is eradicated for good. Chiluba noted that the failures of the peace agreements signed in the past has been due to the fact that the real youths have not been the ones signing but that they have been misrepresented by old politicians masquerading as youths. “When you look at the people who were claiming to be youth chairmen from both the PF and the UPND, the problem is that those people are not youths, now you are dealing with an issue which is related to the young people and you are having people representing the young people who are not actual youths so you find that young people are being misrepresented in a lot of platforms because the people who signed that agreement are not young people so how do you expect this thing to work. “The people who signed the peace agreement prior to the 2016 elections are not young people. What happens when President Lungu meets Hakainde Hichilema? They shake hands, they don’t fight but what happens when young people meet they fight! So why can’t we deal with the actual perpetrators? This is why we as CYLA we think that this is just like an academic exercise even that agreement which was signed we don’t really expect to see much fruits bearing out of that activity and that is why as CYLA we have taken advantage of that activity which took place and we have began a process of designing a road map for implementing the peace accord which was signed. We are designing a road map for us to completely eradicate political violence,” Chiluba said. Otis Bwalya who represented the UPND on the radio program said that what was important was that the waring parties have come to realise that they have a responsiblility to safe guard the peace of country. He said the peace arccord was a step in the right direction saying without peace no meaningful development can take place in the country. “What is more important is that we have come to realise that we have a responsibility to safe guard the peace of this country because we have also come to realise that this country can not go anywhere, this country can never develop, can never see that meaningful development with all these issues around particularly issues to do with violence. “That is what has happened in the past quiet alright there has been all these agreements were we signed and all that but for us we feel it is the first time as young people that we are doing this thing. It is the first time that as young people we have come together and signed a peace agreement such as this one. It is a step in the right direction and speaking on behalf of UPND especially from the youth wing we are only hoping and praying that this will not only end on paper. We want to pledge our commitment as youths from the UPND that we are going to support this peace arcord and ensure that it produces the desired results,” he said. And Siwale noted the need for youths to define their role and responsibility if they are to avoid being used as tools of violence in political parties. “If you can not define your role, your responsibility as a youth its very difficult to actually do what is right otherwise you find yourself in a situation were you are actually moved by those dictating to you and in the process you find yourself doing wrong things. “First you must understand that when you engage in political violence in any form of violence as a political party you are not doing yourself any favour, in the actual sense you are decampaigning yourselves,” he said. The radio discussion program was centred around the peace accord which was signed by the PF and UPND denouncing political violence which has characterised the recent by elections in the country.